Heads up everyone, ’cause there’s a new candy bar in town: Snickers Charged. This new version of the Snickers bar means business with its flashy, bright silver wrapper, red accents, and an image of a snorting, angry-looking rhino on the front. How is this Snickers different, you ask? Well, this Snicker’s limited edition contains caffeine, taurine and B vitamins to provide a big energy surge to help you get though your busy day. The first thing I did was flip this candy over to see what it was really made of, even though the flavor description remains the same: milk chocolate, peanuts, caramel, and nougat. Upon inspecting the ingredients, there’s 60mg of caffeine, 250mg of taurine, and 10% of your daily value of Vitamin B6, Vitamin B12, biotin and Pantothenic Acid in this Snickers. There’s also 4% calcium and 2% iron in there too. Considering all these additions, the size of this Snickers bar is slightly smaller than the average one, weighing in at 1.83 oz where the original as at 2.06 oz. I guess that extra .23oz with caffeine would have been too much to handle! When I unwrapped the bar, the one thing that struck me right away was that the enrobing pattern on the top of the bar is different. 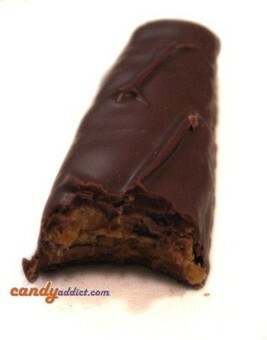 The normal Snickers have nice criss cross braided folds on the top from the enrober machine, whereas this is almost entirely clean, except for two half hearted diagonal folds that are unevenly spaced toward one end of the bar. The smell is the same as a regular Snickers: chocolately, peanutty, sweet. Taking my first bite, the bar tastes basically the same (from what I remember) too. There’s sweetness from the chocolate, a nice roasted nutty flavor with a kick of salt from the peanuts, a good chew from the nougat… waitaminute. Something does seem to be missing! Where is the caramel? I noticed almost immediately that I didn’t get nice, gooey strings of caramel reaching from my mouth as I pulled away to chew. Looking at the cross section, there does appear to be no strip of caramel. Confusing, isn’t it, since it is listed on the description on the front of the package. This is what I think happened, it’s in there, but not as much of it is there as in the original. 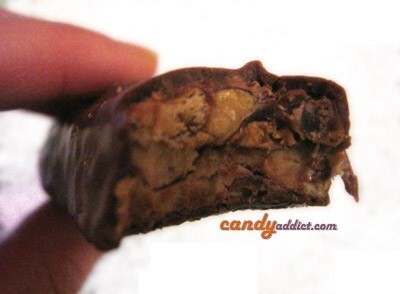 By dissecting the bar (you know, eating off the chocolate coating and then the peanuts one by one) I noticed that the caramel is thinly wedged in with the peanuts. They’ve compacted the two in to the same space. As pleased as I was to finally find the caramel, I don’t think I like the new roommate situation that the peanuts and caramel have going on. Why? Well, I can’t taste the caramel at all! I find that I lack the extra sweetness that it delivered. Another thing I noticed about this bar, is that there’s a strange salty bitter aftertaste. I don’t know about you, but bitterness isn’t something I want in my candy bar. SNICKERS Chargedâ„¢ contains 60 milligrams of caffeine. So if you’re a die-hard Snickers fan who isn’t a fan of the currently available ways to provide yourself with some caffeine, Snickers Charged is for you. I do admit that on days when I’m needing a little extra “oomph”, a Snickers Charged sounds much more appealing than another cup of coffee of a can of soda. I’ll stick with the original Snickers & my daily 12 oz. cup of coffee—thanks for the review! I love chocolate, but do I really want more caffeine in my life? I think I’ll pass on this one too. Anyway, I wasn’t all that impressed, so haven’t had one since. I’ll choose a regular Snickers over this any day. I DO like the Peanut Butter Snickers, though! Mmmm! I tried these… and I can taste the caffiene in it… kind of bitter. Not a bad bar though. Its a pretty good bar looks kinda like and ecko snickers cuz of the rhino ! I had one of these with a red bull makes for a good pick me up combo !!! Yeah, he forgot to mention the bitter aftertaste of the caffiene or taurene. Makes me feel like I’m using the milk as more of a chaser than a thirst reliever. I won’t be getting any of these again. Tried it, like it, will eat more if they keep selling! If you like chocolate and caffeine its a good way to meet both needs. I found this bar really helpful! It gives a LASTING energy boost instead of the short-term boost most energy bars/drinks give. A mild aftertaste is expected – it’s a nutrient-injected snack! I am glad they came out with this. I actually dont mind the less sugary taste. I sometimes need a quick pick me up while I am in the Law Library and taking a break to run to Starbucks often isnt an option when I am burning the midnight oils. Or after lunch at work I need that UMPH to make it through the day and on to my lawschool classes in th evening. I agree with the review, but the benefit outweighs the slight negative. Now where can I get ahold of this? I live in Norway and the price Amazon takes for sending this is 3 times the sale price.. The other 2 places listed as selling them, do not. Please Email me if anyone is reading this. Hi Frederic! Have you tried eBay? There are a few listings there; it looks like you could get 24 bars for about $24 which should include shipping to Norway (I used the calculator on the listing). You just might have to eat them rather quickly – the one listing I looked at had them expiring in November. I’m used to eating protein bars, so I didn’t notice any odd aftertaste at all. I don’t know if they all carry the same stuff, but my local Grocery Outlet has Snickers Charged at 3 for a dollar; not bad! I needed a caffeine boost this morning. Snickers Charged with a cup of Bonkers tea really hit the spot! MI ESPOSA ESTA EMBARAZADA Y POR ERROR NO ME DI CUENTA QUE EN EL ENVOLTORIO DECIA QUE NO ERA RECOMENDABLE PARA MUJERES EMBARAZADAS, QUE PODEMOS HACER? SERA UN PROBLEMA O NO? I got hooked on these a couple of months ago. More than anything I’ve tried, these really gave me the boost I needed to sit in front of a computer screen for 8 hours a day. IMHO, the taste is very similar to the regular Snickers bar, but a little less sweet. There is the caffeine aftertaste on some bites. But, it’s not bad. I hope they keep manufacturing this bar, as it has become a regular part of my morning routine.